The single contribution to Just Kick It Till It Breaks by Meredith Sparks is a pair of digital prints, defaced with black glitter and pieces of aluminum foil and presented adjacently to form one work. 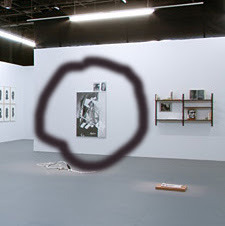 Called Untitled (Gudrun with record player) (2007), it depicts Gudrun Ensslin, a member of the revolutionary/terrorist group the Red Army Faction, also known as the Baader-Meinhof Gang, who died with several comrades under mysterious circumstances on October 18, 1977, in a West German prison. The smaller work depicts a turntable owned by Andreas Baader. Baader was a leader of the Red Army Faction and Ensslin’s boyfriend. Glitter and foil covers portions of the images; this takes on some geometric forms and straight lines but are mostly irregular shapes, acting as both a decorative element and an intervention. The word FOUND in all caps crosses the scan of the record player. The end result looks like a mix of Bauhaus design and Russian Constructivist photography collaged by a teenager. Importantly, the linking of a portrait (Ensslin) and an object (turntable), that is, media personality and musical device/consumer product, dovetails with the choice of subject matter in Sparks’s other recent work. She performs similar arts-and-craftsy interventions with scanned photos of bands, musicians, and performers such as the Ramones, Ian Curtis, the Velvet Underground, Talking Heads, Kraftwerk, Elvis Presley, Abba, Roxy Music, Blondie, and so on. Like the Red Army Faction, these bands were active during the 1970s and beyond. The well-known and formerly underground bands are ones that, presumably, the artist admires or has some affinity toward; they also have a built-in audience of fans, which easily works in Sparks’s favor regarding the publicity of her work. Her subject matter reminds me of work by Elizabeth Peyton, who chooses more mainstream subjects (Prince William, Kurt Cobain, Eminem) for her paintings. While Peyton lovingly admires her subjects, Sparks graphically cuts and scratches her images—an aggressive attack—but she also decorates them like a devoted fan with a weird sense of reverence. This kind of respect reminds me of punk shows where the audience constantly tries to upstage the band onstage, transcending their role of passive observer but not quite reaching the level of the performers. Taking the curatorial theme into consideration, Untitled (Gudrun with record player) obviously romanticizes a member of the West German terrorist group in the same way she does with her images of musicians and rock stars. She also, I think, recognizes that images themselves have the power to do this. Sparks is aware of this seduction, but such an awareness falls short of “questioning” or making a critical commentary. While thinking about Sparks’s work I am reminded of those t-shirts with Alberto Korda’s photograph of Che Guevara sold at shopping malls across the country and in “punk” shops on Saint Mark’s Place here in New York. In both cases, the image is severed from its revolutionary potential and meaning to simply presents superficial, truncated knowledge and empty gesture. This is a pose, and is not a critique, of revolutionary chic. Sparks writes that the manipulations to her source image “establishes a stuttering or skipping effect; this effect disrupts the image’s cultural circulation, a circulation in which images continually replay events and circumstances, where meaning is prescribed, shaped and enacted repeatedly for the viewer.” I am still trying to see how this works. One last note: the German artist Gerhard Richter painted both the record player and a cropped version of the Ensslin photograph, showing her from the waist up, in his renowned painting series October 18, 1977 (1988), now in the collection of the Museum of Modern Art. I believe that most people in the art world are familiar with the Red Army Faction through these paintings more than any other source (news, books, being there, etc.) Scholars have persuasively argued for the importance of memory and history in Richter’s work; I don’t think revolutionary chic ever figured into their interpretations.